In any metallic conductor large no. of free electrons are available these electrons are in random motion as a result of which their average velocity is zero and there is no net flow of electron so current is zero. 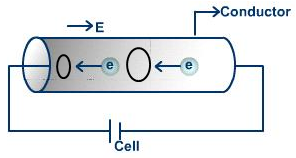 When the conductor is connected to a battery, an electric field is setup in the conductor and the electrons experience electrostatic force and accelerate in opposite direction of electric field. These electrons collide with the neighboring atoms and ions. Due to continuous collision their average acceleration becomes zero and electrons acquire constant average velocity called drift velocity. Hence the constant average velocity acquired by the electrons in any conductor subjected to an electric field is called drift velocity.